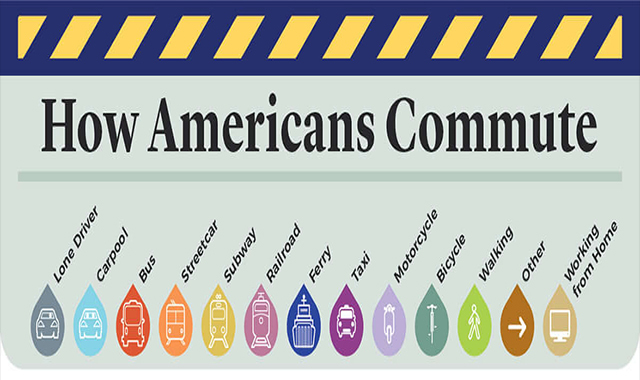 How Americans Commute #infographic ~ Visualistan '+g+"
What's your daily commute like? For Americans all across the United States, the commute can certainly be rough. This infographic which was brought to you by CentralParkBikeRental.nyc takes a look at the top 30 most populated Metropolitan Statistical Areas (MSAs) in the country for the means of transportation to work. It also calculated percentages using ACS five-year estimates from 2017. Some of the statistics outlined in this infographic are pretty interesting! For example, did you know that in New York City, 31.15% of people use public transportation? Or that only 16.84% of San Francisco residents even use public transportation? In the United States, it was determined that 85.6% of all workers travel to their jobs via car, truck, or van. That's roughly 127,053,717 in total! Of that, the city that has the most lone drivers is Decatur, AL, at an astonishingly high rate of 89.11% residents!